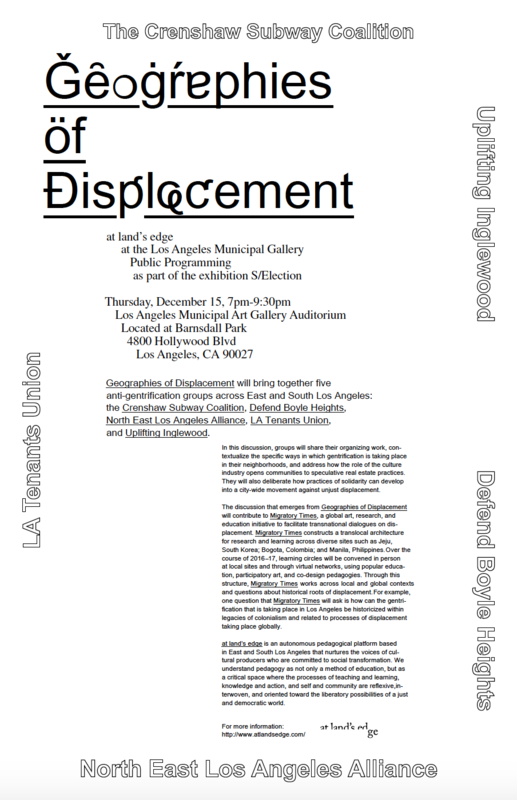 Geographies of Displacement will bring together five anti-gentrification groups across East and South Los Angeles: the Crenshaw Subway Coalition, Defend Boyle Heights, North East Los Angeles Alliance, LA Tenants Union, and Uplifting Inglewood. In this discussion, groups will share their organizing work, contextualize the specific ways in which gentrification is taking place in their neighborhoods, and address how the role of the culture industry opens communities to speculative real estate practices. They will also deliberate how practices of solidarity can develop into a city-wide movement against unjust displacement. The discussion that emerges from Geographies of Displacement will contribute to Migratory Times, a global art, research, and education initiative to facilitate transnational dialogues on displacement. Migratory Times constructs a translocal architecture for research and learning across diverse sites such as Jeju, South Korea; Bogota, Colombia; and Manila, Philippines. Over the course of 2016-17, learning circles will be convened in person at local sites and through virtual networks, using popular education, participatory art, and co-design pedagogies. Through this structure, Migratory Times works across local and global contexts and questions about historical roots of displacement. For example, one question that Migratory Times will ask is how can the gentrification that is taking place in Los Angeles be historicized within legacies of colonialism and related to processes of displacement taking place globally.